A wide variety of south polar terrains are on display in this spectacular HiRISE color image. 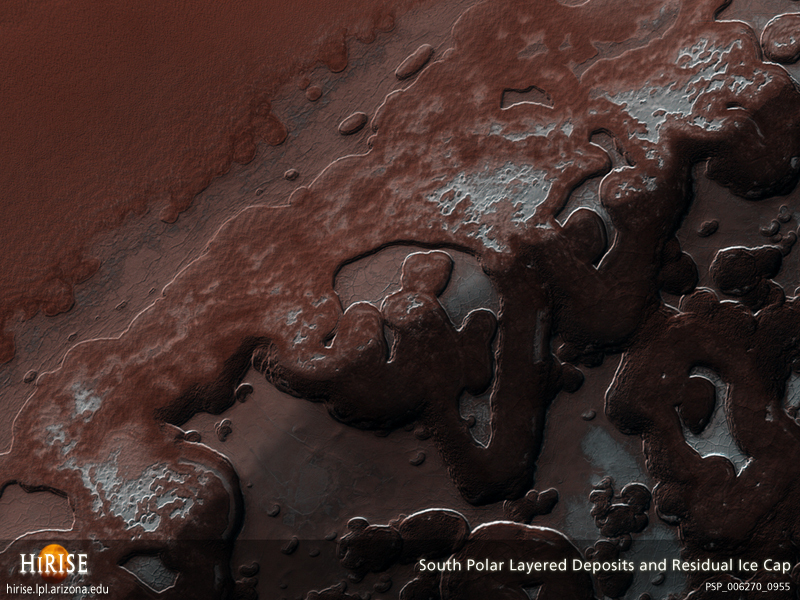 The reddish material in the upper two thirds of the image is the south polar layered deposits (SPLD). These deposits are a stack of layered, dusty water ice. Scientists believe that these layers record previous climatic conditions on Mars, much like terrestrial ice-sheets provide a record of climate change on the Earth. This image shows the face of one of the many scarps or shallow cliffs that cut into the polar layered deposits. These scarps expose the internal layers within the SPLD. You can see these climate-recording layers in the upper two thirds of the image running from lower-left to upper-right. The terrain in the lower third of the image is quite different in both appearance and composition. The bright, white-ish material is a thin covering of carbon dioxide ice draped over the flat areas of the SPLD. This covering of carbon dioxide is being eroded away by expanding flat-floored pits. Parts of the floors of these pits show the reddish brown coloring of the underlying polar layered deposits. These pits have eroded the carbon dioxide ice layer to such an extent that only isolated mesas remain today and even these shrink in extent by a few meters each year.